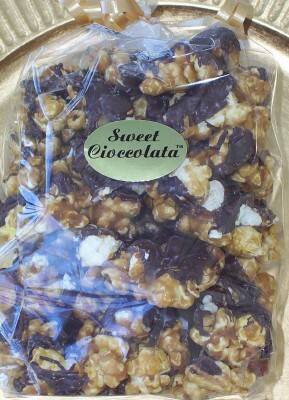 Chocolate Drizzled Flavored Popcorn. Drizzled in Milk or White Gourmet Chocolate. Popcorn flavors include Vanilla, Carmel/Peanut, Strawberry and Fruit. Fruit is an assortment of strawberry, orange, pinneapple, blueberry and apple. Each bag is approx. 6 oz.